The field of igneous petrology – the study of the chemistry and origins of the many igneous rocks around the world – is infamous for the number of names. It is off-putting for students and, frankly, I don’t know of anyone who has an interest in knowing them all. The earth is constantly producing new rocks – slabs go down the subduction zones, get heated up and erupt back onto the surface. 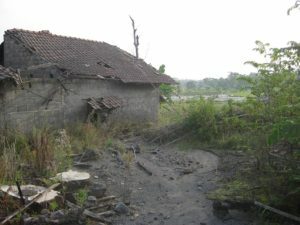 One example is Indonesia with hundreds of volcanoes strung out along it chain of volcanic islands. Plates diverge as in Iceland, and new magma comes to the surface. Possibly we know less of why hot spots are where they are – but Hawaii is the source of great interest with its vigorous activity in 2018. My daughter just bought a house in Lake Tahoe situated in the Sierra Nevada Mountains. The rocks there are very different – mainly granitic and were formed from very different processes. In 2018, all eyes are on the erupting volcanic magmas of Hawaii – rivers, fountains, and vertical plumes – all producing a dark, fine-grained rock known as basalt. Basalts melt in the earth’s mantle and are relatively low in silica – hence they are ‘runny’. Magmas with more silica are ‘thicker’ in texture or more viscous – and are characteristic of the volcanoes which produce tall columns of ash and the hot, fast moving gaseous clouds which move quickly down the slopes of the volcanoes – like the recent eruption in Costa Rica. The most silica-rich erupt in thick masses – actually oozing slowly to the surface. 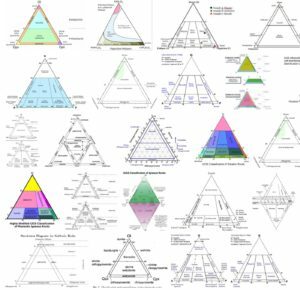 As I was looking for a simple triangular diagram to show how composition relates to names, I looked for ‘images’ on google. Wow! 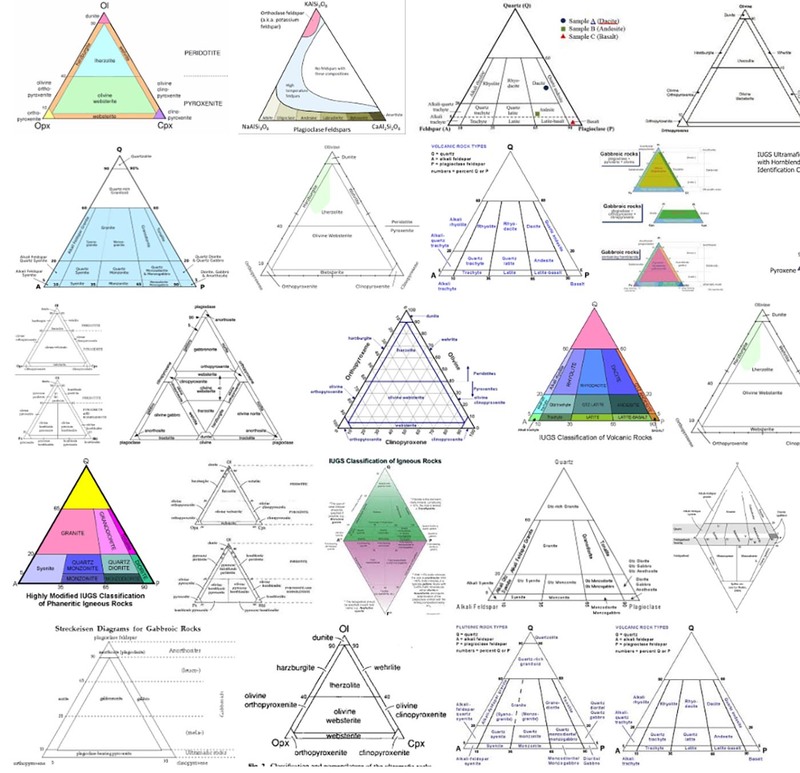 Don’t attempt to read these diagrams – they are professionals only – and even then, my head hurts! Here is all you need to know about a few rock names that will get you far in life – as in other posts – probably more than you need to know. If a rock is dark and heavy, it’s probably from deep In the earth – if you see big crystals it cooled slowly inside the earth so the crystals had time to grow – we can call almost all of those gabbros. If you don’t see crystals or crystals in a fine, black rock, then it erupted on the surface – and it a basalt. If it is very light colored and light in weight, it is rich in silica and the rocks with no visible crystals are called rhyolite. With big crystals – granite. In between in color and weight, then the volcanic rock is an andesite and the one cooled inside the earth is an andesite. The volcanoes producing the andesite are the most explosive and most dangerous. The unexpected 2018 Costa Rican eruption is definitely andesitic. 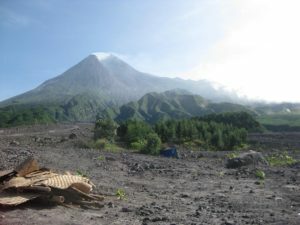 Here I am on Mount Merapi, near Yojakarta, Indonesia in 2012. Lots and lots of andesite from the 2010 eruption and lots and lots of destruction. Mount Merapi is at it again in 2018.